Have you ever needed to add multiple Parametric Constraints to your corridor, but don’t want to wait for the corridor to reprocess after adding each one? There is a simple trick that will allow you to do that. This is for OpenRoads Designer CONNECT Edition, but it works the same way in PowerGeopak SS4. 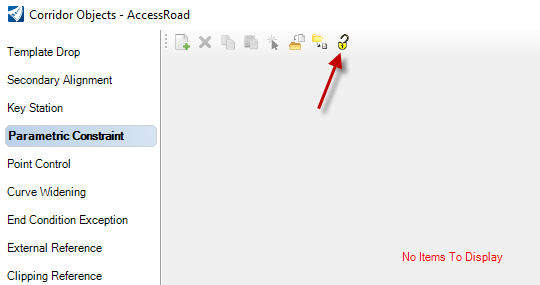 Open the dgn where your corridor is located, and from the Corridors menu on the ribbon click on the Corridor Objects (“The Bucket”) icon. Select your corridor, and this will bring up the Corridor Objects dialog. Select Parametric Constraint on the left, and before you start adding any constraints, click on the lock icon at the top so that it’s displayed as unlocked. This will deactivate the rule. Now proceed with adding the Parametric Constraints. Once completed, click on the lock icon again to activate the rule. Sometimes you may need to select all the constraints and check off and on the Enabled box on the right to get the software to recognize the changes. If you didn’t have the Dynamic Cross Section view open already, you can open it now, and verify that the Parametric Constraints were added to the corridor. Patrick is a Senior Consultant at EnvisionCAD and has comprehensive experience with Bentley software including MicroStation, GEOPAK, and OpenRoads. He is an expert in the implementation, configuration, instruction, development, and customization of Bentley software.